Before we left for this world tour, people often asked me which place I was most looking forward to. Machu Picchu always came up first on the list. I’m a big hiker, and although I knew little about this Incan relic, the romantic pictures enchanted me. I was eager to strike it off my bucket list. Little did I know the enormous efforts I would undergo to make this dream a reality. I planned the first month and a half of our world tour meticulously. Peter and I researched all the things we could do in each of our countries and laid out a day-by-day plan for the U.S. and Mexico. However, when it came to Peru, I just thought to myself, “It’s so far out (2 months). I’ll figure it out more when I get there. You can’t plan everything, Emily. Go with the flow.” Don’t get me wrong, I couldn’t resist doing a little bit of research on Machu Picchu trekking tours ahead of time, but it was all ridiculously expensive and I’d heard from several travel bloggers that I could save half the cost if I just booked everything when I got to the country. 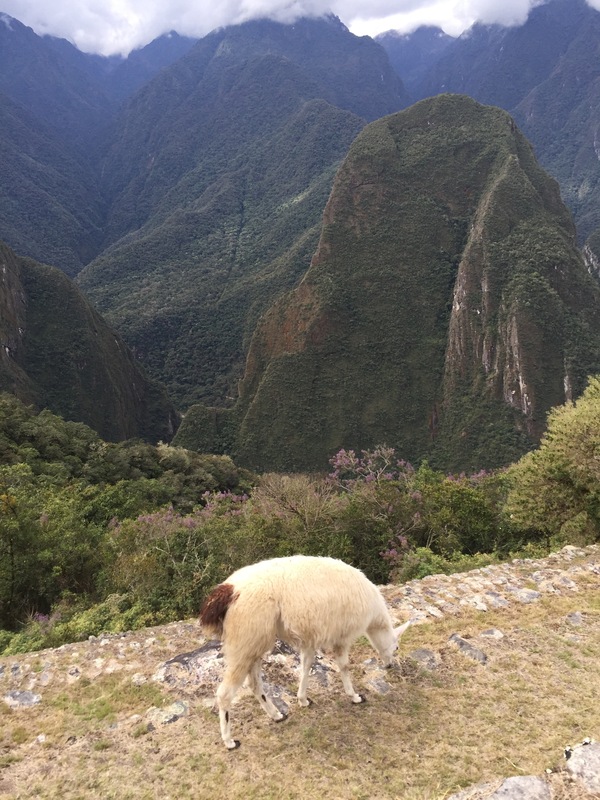 So along I went, with no real plan or understanding of what it takes to get to Machu Picchu. 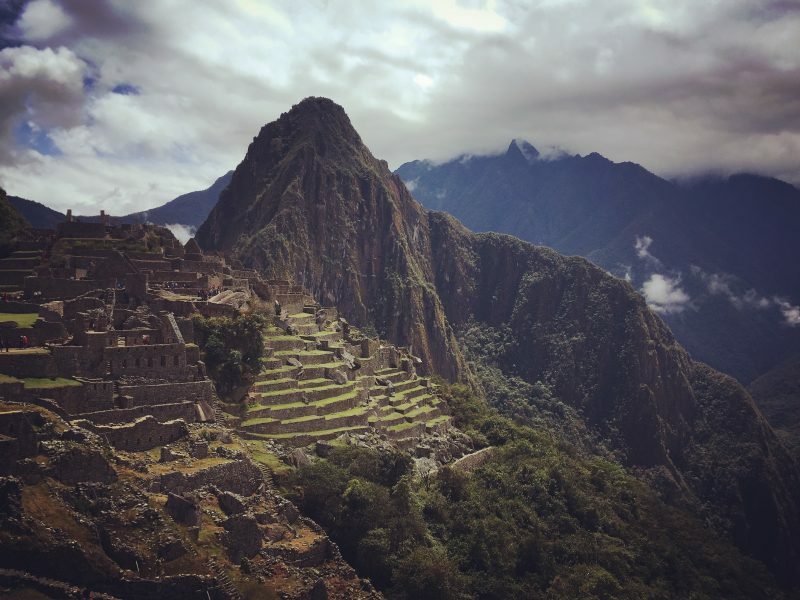 What I quickly realized when I got here was that Machu Picchu is anything but an affordable, easy excursion. The whole process was so complicated it made my head hurt for several days, and although the prices are surely much cheaper here, they are still ridiculously expensive compared to everything else we’ve done, or plan to do, on this trip. After purchasing the flight from Lima to Cusco (the closest city to Machu Picchu), the train ride from Cusco to Agues Calientes (the closest actual town to Machu Picchu), the bus up to Machu Picchu, and the guide, Peter and I were looking at a bill of $835 USD. Not what I had budgeted for. Since Chichen Itza in Mexico had been about $60 USD for both of us, I had never imagined Machu Picchu would be so pricey. The cost to do a trek would have been several hundred more. 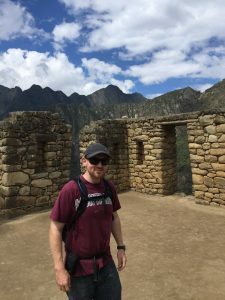 Needless to say, my excitement for Machu Picchu soured quite a bit from the sticker shock, and Peter and I decided to skip the trek and just go straight to the gates. (I am so thankful for that decision now!) 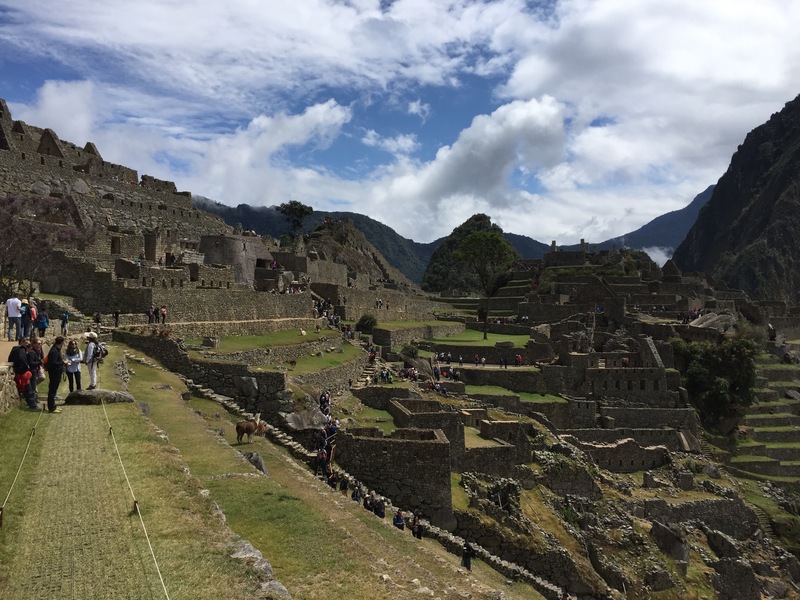 I later found out from our tour guide that 6,000 people visit Machu Picchu a day and the only way they can figure out how to lessen the number of visitors is by raising the prices, but it’s not working because most people, like me, aren’t aware of the huge costs until they arrive. The place was packed! It was very difficult to get a picture without crowds. A few days before leaving for Cusco, I offhandedly mentioned to Peter that there was so much to juggle and line up for Machu Picchu that if anything went wrong, the whole thing would tumble like dominos. I would soon experience that problem first hand. The night before we left Lima to fly to Cusco, I got a terrible stomachache- it sounded like a raging civil war in my guts. I had a fever and felt nauseous. The last thing I wanted to do in the morning was get on a plane. We took an Uber to the airport that was possibly the most dangerous drive of my life. Our driver managed to piss off another driver who began screaming at him through his window. He drove his car right next to ours and slammed on the breaks, purposely knocking in our driver’s passenger-side mirror. At another point, a car tried to merge into the lane we were in and got within 2 inches of our vehicle. I could have rolled down the window and put my palm on it. Despite all this, I was hardly fazed. It was taking all my energy and focus just to keep from getting sick all over this man’s car. Amazingly, we managed to survive the trip and get onto our flight to Cusco. The flight wasn’t as terrible as my nightmares, but as soon as we got to our hostel, they called a doctor to come see me. That is one thing I wish we still had in the U.S.- house calls. I told him my symptoms and he prescribed me some medicine for a parasite. I stayed in bed all day. I didn’t even see Cusco. The next morning, we took the three and a half hour train ride to Agues Calientes. I had enough energy to go out and eat, but that night my already terrible sickness took a turn for the worse. Once again, I didn’t get any sleep all night as I ran to the bathroom every 5-30 minutes. We were supposed to go to Machu Picchu at 5:30 in the morning to catch the sunrise, but I was beginning to wonder if I would be able to make it there at all. Finally, at 4am I was starting to feel better, and after a slow morning, I told Peter I was as ready as I’d ever be to head to the mountain. We left at 10am. We headed to the bus only to find a line that never seemed to end. We finally got to the back with 500 people in front of us. Did I mention it was raining? Luckily the line moved quickly and we headed up the steep, narrow switchbacks to Machu Picchu. Seeing it appear in the distance, I nearly cried from relief that I had finally made it. Little did I know, my bad luck was just beginning. The line to the bus after we had already moved forward quite a bit. You can’t see the end of it. 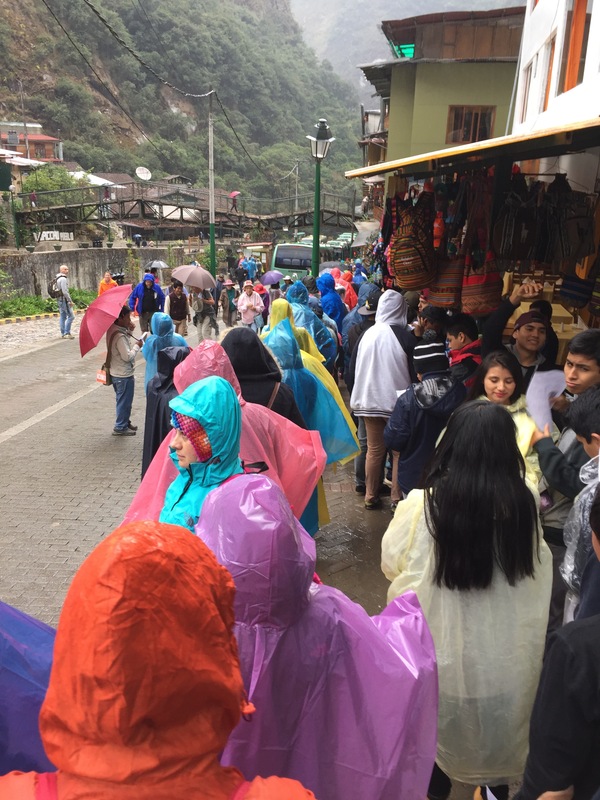 We got off the bus only to find another huge crowd of people lined up to get into Machu Pichu. We found a tour guide named Naomi. (She joked that she just needed to lose some weight and a few years and she’d be just like the celebrity Naomi Campbell.) She was an absolute sweetheart. I had trouble understanding a lot of what she told us because of her thick accent though. When we got through the gates and came around the corner to get the full view of Machu Picchu, I was amazed at the sheer size of the place. Naomi said they estimate only 200-400 people lived there and they only have 25% of it fully restored, but it looked like a full-blown town. It’s a lot more than you see in the classic pictures. Over the next two and a half hours, we weaved through little corridors between the stone buildings, climbed stairs, explored homes, churches, and storage areas. Definitely the best restored ruins I’ve seen by far. I wish I could say this is where everything came together and we drove off into the sunset, but sadly, reality was quite the opposite: first off, the place was crawling with people. You often had to wait several minutes to climb stairs or look at something. Naomi said that the tourists start arriving earlier and earlier, so by 4am there is a huge line for the park and it doesn’t let up until 2pm. So if you really want to avoid the crowds and you aren’t set on catching the sunrise, DON’T listen to every other blog out there and go around 1:30pm. It closes at 5:00 pm so you have plenty of time. When we were leaving around 2 pm, the buses arriving were empty, and the lines to leave were as long as they were earlier that morning. That wasn’t my major issue, however. 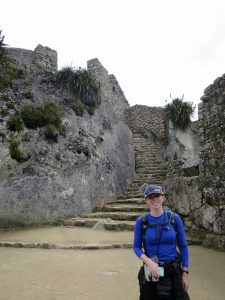 I had felt okay when we showed up at Machu Picchu, but as we trekked around the massive ruins at 8,000 feet. I began to get worse and worse. I was struggling to breathe and was doing everything I could to keep it together for our tour guide and Peter. Even though we took several breaks, I was going five times the speed I would have if I were on my own. The altitude mixed with my illness was a scary combination. You wouldn’t know it from the pictures, but I was seriously struggling. Don’t let the smile fool you. I felt horrible. After we parted ways with our guide, I finally allowed myself to stop putting off the inevitable and took a turn for the worse. I could hardly stand. Peter got me some coca tea for altitude sickness from the restaurant while I kept my head in my hands. I suddenly couldn’t breathe. I was so out of breath that I couldn’t speak to Peter. I had to croak out what I needed and make frantic hand signals. In my mind, I was panicking as each breath became more and more strained. Luckily, I remembered my sister’s boyfriend Thiago telling me that when people die in the ocean it’s because panic killed them, not that they couldn’t swim. With this in mind, I repeated to myself “Don’t panic” and tried my best to calm myself and keep taking deep breaths. After I finished my tea, which definitely helped, we headed back to the bus line. I was able to breath again, but still wouldn’t talk in order to try and conserve energy. We headed back to the hotel and I got to sleep a half hour and eat a little soup before we had to get on our return train. The sleep helped me feel a bit better so for a few minutes I mistakenly believed things were maybe going to get better from here. Turns out, I couldn’t have been more wrong. . .
You have me on the edge of my seat! I can imagine your pain! I wish I would have been here for your face time last night! I miss you both!